The Cumberland & Dumfriesshire Farmers Mart P.L.C. 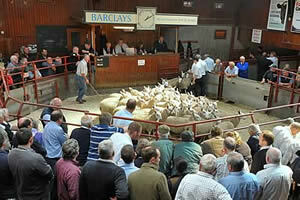 held their weekly sale of store lambs at Longtown on Tuesday 5th October 2010. A grand show of 4,384 lambs were forward to a full ring of buyers, with trade £3 to £4 firmer on the week. The sale was topped at £70.50 for Texels from Messrs Bell, Greenknowe, others £66.80 Rinnion Hills, £65.50 High Lovelady Shield, £63.20 Sharplaw; Beltex £67 Greenknowe; Charollais £61.20, £56.80 Low Stokoe; Cheviot Mule £60.50, £54.80 Sharplaw; Blackface £59 Dunblane, £56 Hareshaw, £52 Megdale and Townshields; Greyface £56.80 Old Hall and High Lovelady Shield, £54.80 High Parkfoot; Lleyn £55.50 Templand; Swaledale £48.20 High Parkfoot, £41 Byers Hall, £40.50 Underbanks; Herdwick £40 Boathouse Cottage. The 870 Cheviots sold to a top of £57.50 for Northie Types from Sorbietrees, £55 Meiklewhitriggs, Hill Types to £56.50 from Girnwood, £56 Crosslee, £55.50 Windyhaugh.